Published on 4 October 2012. John Simpson Kirkpatrick was a man from South Shields who deserted the merchant navy, and then enlisted with the Australian army at the outbreak of the First World War. He landed on the Gallipoli Peninsula in April 1915, and found Duffy the donkey within hours of his arrival. Over the following weeks, John and Duffy ferried wounded soldiers back from the front line and no man’s land while under Turkish fire. It’s said that he sang and whistled while rescuing his comrades, ignoring the rifle fire and flying shrapnel all around him. Unfortunately, this was to prove his downfall, as he was killed by machine gun fire on his 24th day of ferrying the wounded, aged just 22. His actions saved the lives of over 300 soldiers, and he was recommended for the Victoria Cross, though this wasn’t awarded – a decision that remains contentious in Australia (and South Tyneside) to this day. Duffy the donkey survived the attack, and continued to ferry wounded soldiers after Kirkpatrick’s death, under the guidance of Richard Henderson. As the soldiers couldn’t bear to leave him behind, Duffy was evacuated to Greece when the army retreated from Gallipoli. He then disappeared, much to the disappointment of the soldiers who wanted to parade him as a war hero in Australia. Reports differ as to whether the Greeks stole Duffy and sold him (donkeys were worth a lot of money), or whether he broke free and ran into the sunset to live out his days in the wild. 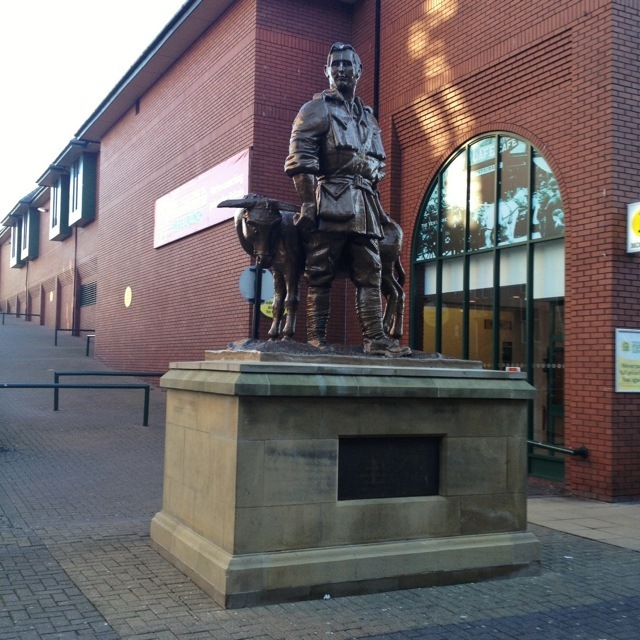 This statue of Kirkpatrick and Duffy by local miner-turned-artist Robert Olley stands on Ocean Road in South Shields town centre. This 1,836th post was filed under: Photo-a-day 2012, South Shields.